Physical Mosquito Control is the portion of our work which involves eliminating mosquito sources, improving access to these sources, or modifying sources to discourage mosquito breeding and encourage the growth of natural mosquito predators. The District staff spends much of its winter time maintaining existing drainage systems to assure that water flows freely to discourage mosquito breeding. 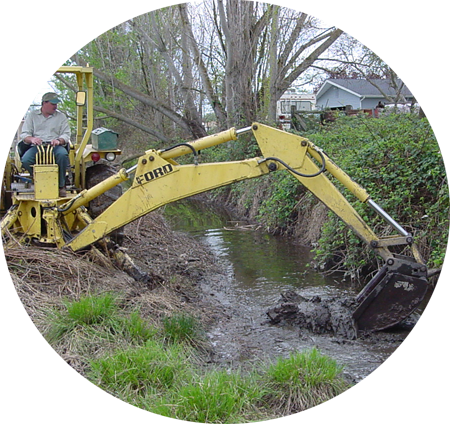 Other physical techniques that are used to reduce large mosquito breeding include making banks of holding ponds steeper to discourage emergent vegetation; removal of brush and berry bushes that provide cover to mosquito larvae, and construction and maintenance of roads that provide access to known mosquito sources that cannot be eliminated, such as isolations along the Sacramento River. Another important aspect of physical control within the District involves source prevention. District staff reviews plans for large construction projects within the Shasta Mosquito and Vector Control District to be sure that they will not adversely affect natural runoff and create new mosquito sources. Cleaning up rubbish that may hold water, ditch maintenance, periodically changing bird-bath water, and cleaning rain gutters are all physical control measures that everyone can take around their homes to decrease the health risk and annoyance caused by mosquitoes.